D2037 Security Bag Endorsement Stamp and Manual Deposit Tickets 100018, 100056, 100058, 100059, 200032, 200033, 100050, 100017, 200034 and Laser Deposit Tickets 81019 and 80200. NEW FEATURES - Ultra-level tamper-evident closure & NEW - Receipt on the release liner for convenient tracking and deposit identification. This is a Heavy Duty, stronger yet thinner plastic! Especially designed to protect against theft and show alterations. 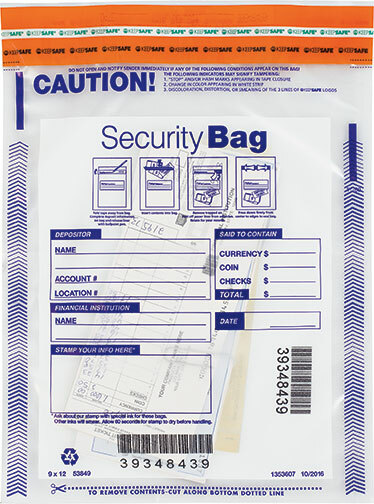 Our "Gold-level" Seal Security Deposit Bags are made of #4 recyclable plastic with unique bar-coding and numbering on bag and receipt, these special features make for easier processing, less risk of errors, convenient tracking and deposit identification. All our deposit bags meet Federal Reserve guidelines! Our new Gold-level Seal indicates our highest degree of security against all mechanical (hand-pulling), chemical (solvents), thermal (hot air and freezer spray) and moisture (licking with tongue) tampering attempts.